As we mentioned in our last blog, we’re giving you the opportunity to win an illustration of an inspiring woman in your life, drawn by Lydia Ortiz, the illustrator of the Little Feminist Series. 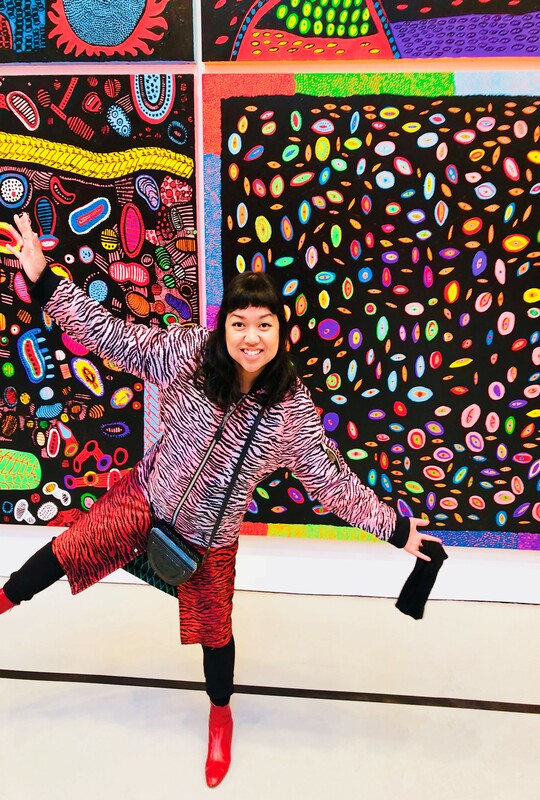 We chatted with Lydia Ortiz to find out how she got involved in the project, what inspires her, and how she inspires others through her art. Who came up with the concept of the Little Feminist Book? How did you get involved with the project? I helped concept the project and co-created the format with Mudpuppy Art Director, Emily Kleinman. Often, kid’s titles stick to popular themes (fairies, ballerina, princess, unicorn) and they’re all great, but I suggested we try something more relevant to our current political times. It was great to experience a real team effort since we had people from Galison and Mudpuppy Sales, Marketing, and Design teams pitch ideas for the project. We were so excited to have the full support of our Creative Director, Susanna Ko, as Emily Kleinman developed the editorial concept and wrote the text, and I was so thrilled that I got to design the format and illustrate the little characters of this important little book for kids. Why do you think it’s the right time for this book? I think it’s the perfect time for this book since the past year with the current administration has brought a lot of negativity and conflict. Our book tries to combat that pessimism by reminding the readers, both the parents and their children, that these strong women exist and that we can draw inspiration from their narratives. Do you feel like you left anyone out of the books? Are there any other powerful women you’d like to spotlight in a future series? This was definitely the most difficult part of the project! We only had room to feature 16 women. We started it with a very long list and editing them down to only 16 was like pulling teeth. As an immigrant woman of color, it was very important for me to see more diversity in products like these! I know this book was popular with our customers. Will there be any other product additions to the Little Feminist collection? 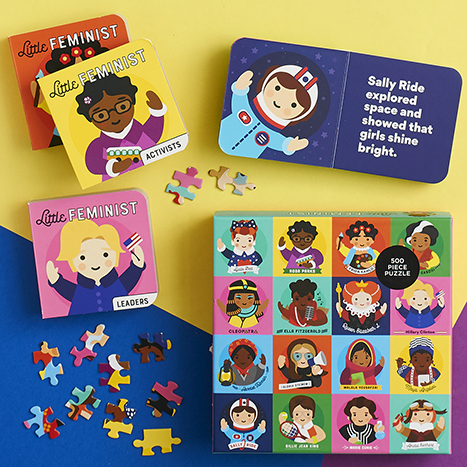 Mudpuppy’s fall list will include a Little Feminist Box of Magnets, Mimi Memory Match Game, and a Locked Diary! But I’m also very excited about our Little Scientist and Little Artist book series. Historically, women aren’t usually highlighted in the science and art worlds, so we tried to include as many women as possible. How do you keep your design fresh and new? Where do you draw inspiration from? I do this by making something for myself everyday. A little drawing or a little collage. For inspiration, I have to be out in nature. Nothing refreshes my creativity more than being out in nature. If I’m stuck in a city, I usually go to dusty libraries and old museums. I tend to gravitate towards things that have a history. Most people think of art and design as beautiful to look at, but it can also inspire others to action. What are some inspiring pieces that you’re most proud of? Most recently, I was commissioned by The Washington Post to create art to celebrate the anniversary of the Women’s March. I’ve had a few people write to me after seeing my piece saying that the piece really spoke to them and that it empowered them. Instagram commissioned my husband and I to create a mural at the Flatiron district over a year ago. The mural itself encouraged people to interact with the art and to speak to what they stood for during the 2016 Election. It was an amazing experience to see people navigating our art and using it as a tool to speak their voices. I have also been working with Teen Vogue from the past couple of years on creating editorial illustrations accompanying their articles revolving around bullying, mental health, immigration, race and identity. It is such a luxury for me to be able to create work that aligns completely with the things I am passionate about. Is there a fun product idea or trend that you’d like to tackle but haven’t had the chance to yet? Anything else you’d like our customers to know? A lot of my artist friends feel the same urgency I do to use whatever platform they have to help make a difference. I encourage everyone to use their art as a tool to get their voices heard. Draw, paint, collage, sing, sculpt, carve, dance, take photographs, do whatever it takes to get your message out there. Inspire others to act towards positive change. Being creative and inspirational, definitely something we can get behind! Don’t forget, you have until April 29th to enter our giveaway honoring an inspirational and empowering woman in your community.